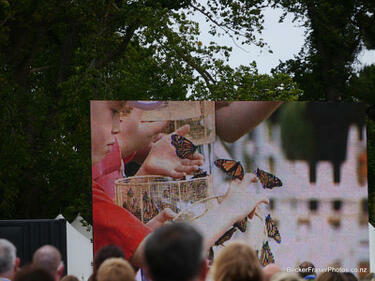 Showing 1 - 20 of 175 results. 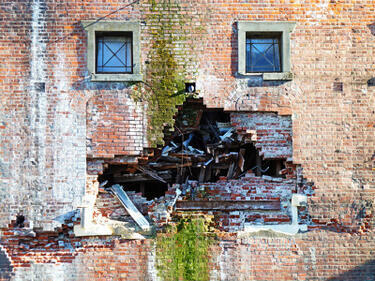 A damaged brick building on Tuam Street. 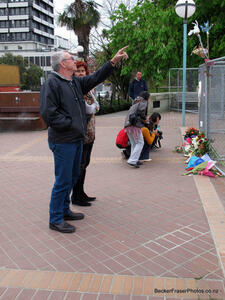 Bricks have fallen from the wall exposing the interior, where a wooden structure can be seen to have collapsed. 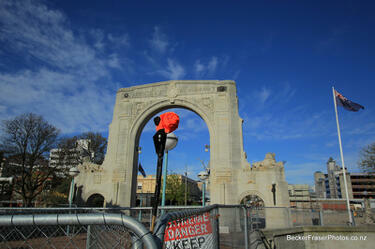 The photographer comments, "This is the damage caused by the numerous earthquakes in Christchurch, New Zealand. 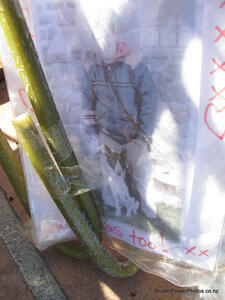 It closely resembles a face and the round blob in the square hole at the top of the nose is a pigeon". 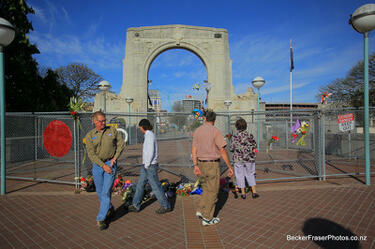 Photograph captioned by BeckerFraserPhotos, "Visitors at the Cashel Street cordon by the Bridge of Remembrance". 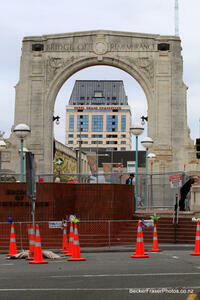 Photograph captioned by BeckerFraserPhotos, "The Hotel Grand Chancellor viewed through the Bridge of Rembrance". 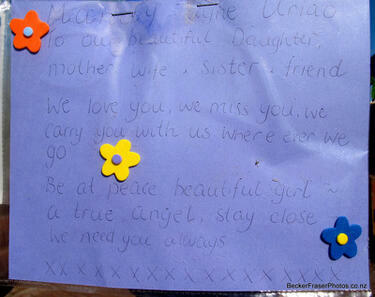 Photograph captioned by BeckerFraserPhotos, "A memorial left at the Cashel Street cordon by the Bridge of Rembrance". 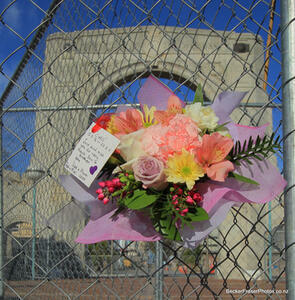 Photograph captioned by BeckerFraserPhotos, "Decorative flowers on the Bridge of Rembrance cordon with the Hotel Grand Chancellor and the Westpac building in the distance". 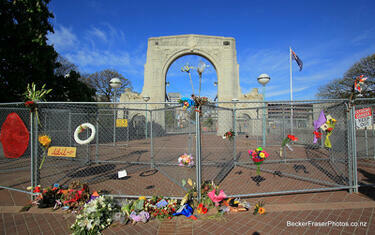 Photograph captioned by BeckerFraserPhotos, "A memorial left by the Governor General at the Cashel Street cordon by the Bridge of Rembrance". 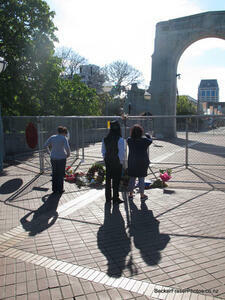 Photograph captioned by BeckerFraserPhotos, "People looking at memorials at the Bridge of Remembrance". 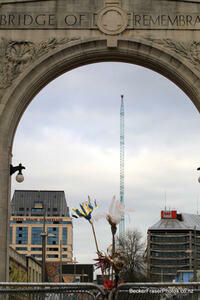 Photograph captioned by BeckerFraserPhotos, "Memorial at the Bridge of Remembrance". 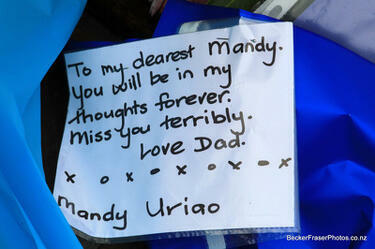 Photograph captioned by BeckerFraserPhotos, "Memorials at the Bridge of Remembrance". 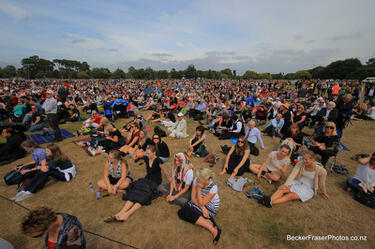 A photograph of crowds sitting in Hagley Park. 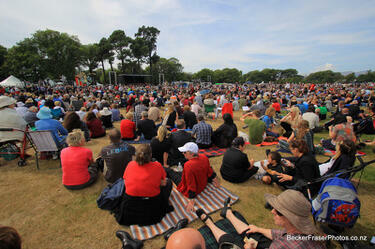 The photograph is captioned by BeckerFraserPhotos, "First anniversary Memorial Service for 22 February 2011". 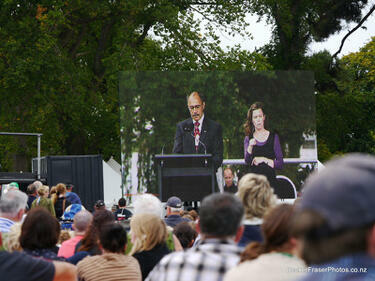 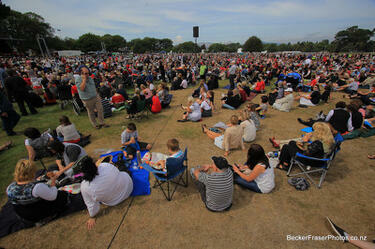 A photograph of a large screen allowing the crowd to see the events on stage at the memorial service in Hagley Park. 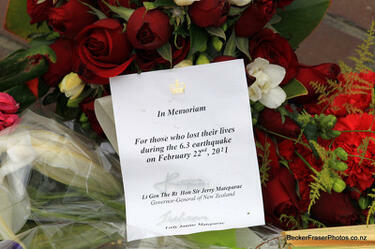 The photograph is captioned by BeckerFraserPhotos, "First anniversary Memorial Service for 22 February 2011". 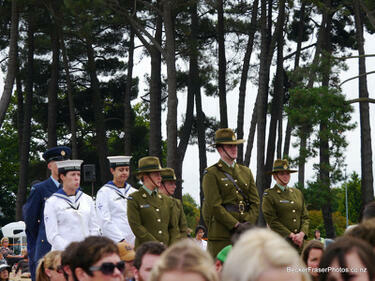 A photograph of armed services personnel in Hagley Park. 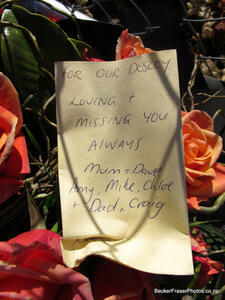 The photograph is captioned by BeckerFraserPhotos, "First anniversary Memorial Service for 22 February 2011".